Root canal treatment is done to treat a dental abscess caused by decay, trauma or fracture. A dental abscess happens when bacteria has entered the pulp chamber and root canal tissues. When bacteria is in the tooth it will cause a dental abscess resulting in pain, sensitivity to hot or cold, soreness when chewing, swelling or a combination of the above symptoms. This treatment is done to save the tooth from extraction and subsequent replacement with a bridge or implant. 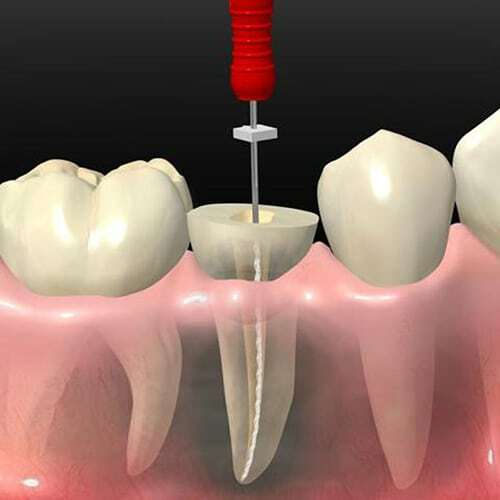 Once the tooth has been frozen with local anesthetic root canal treatment is done without any pain. The goal with root canal treatment is to remove the bacteria from inside the tooth and fill the canals so bacteria can no longer infect under the tooth. Root canal treatment is usually done in one appointment. After root canal treatment is done it is recommended that the tooth is crowned to protect it from fracture.